Shimano's first entrance into the clipless pedal market was done by licensing the LOOK clipless pedal technology from LOOK, and building a pedal from scratch so that it would enclose the cleat system, look aesthetically pleasing, yet permit the cleat to operate and release correctly. The Shimano LOOK compatible pedals actually use a LOOK retention mechanism housed inside a Shimano body. The LOOK system is an amazingly simple device. 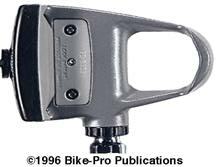 The cleat itself has a rounded front nose that slides into the front of the pedal under a lip that is cast as a part of the body in aluminum. At the rear of the cleat is a locking lever that pivots backward under downward pressure. The lever is spring loaded, so once the cleat is pressed down it rotates back, permitting the cleat to seat in the pedal. It then moves forward to it's original position, with the top of the lever gripping the exposed recess, on the back of the cleat. The lever front is shaped like a blunt "V", and has a flat surface with two angled sides that center in the rear of the cleat holding it firmly. The cleat is shaped with inclines at the sides of the rear that slide against matching inclines in the lever, so that small movements in the foot obligate the cleat to center in the pedal again. But when there is a large movement by the cleat, it pushes past where the two inclines slide against each other to the flat front of the lever so the cleat and shoe slide laterally out, and away from the bike. The inclined surfaces on both the cleat and the pedal exaggerate the foot and cleat movement. Again, from a small movement the system will continue to retain the cleat but a sharp or large movement obligates it to go all the way to release the rider's foot. The question of how you individualize the pedal release point remains, because weight and riding style vary by rider. The rear lever pivots on a steel rod that acts as an axle, which is driven through one side of the pedal clamping lever and then into the far side of the pedal. At its base, coiled around the rod on each side, is a flat wound spring with it's ends sticking out. Toward the outer sides of the pedal, one spring end lies against the bottom of the lever's inner shell. This spring end pushes the inside of the lever down pivoting the top of the lever forward, the top of the lever then grips the rear of the cleat from the top. The inner pair of spring ends stick out horizontally, in the center, pointing in the forward direction of the pedal. These two ends are held down by a tiny steel plate that has a threaded bolt passing through the middle. The bolt itself comes up through the bottom of the pedal body and into this interior plate. As the bolt on the bottom of the pedal is turned clockwise from the bottom, it pulls the plate down, increasing the tension on these two spring arms and therefore exerting more pressure to the rear clamping lever, holding your pedal more firmly to make cleat release more difficult. Loosening this bottom screw, would cause the plate to move up, applying less tension on the spring, making release more likely, with less pressure. Shimano makes three pair of LOOK compatible pedals all with slightly different features. They all come with a pair of SM-SH24 cleats and the necessary mounting hardware. With the Black cleats come soft plastic inserts into the cleat that give the hard plastic cleat traction for walking. These anti- skid points are Grey and helpful for those riders that take breaks while on a ride. The Shimano implementation of the LOOK mechanism is physically smaller than the version LOOK itself uses. 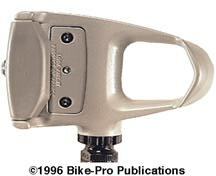 The 7401 pedals were the first use of the LOOK license. 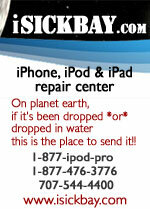 They have been used by Road riders desiring the best for many seasons now. From the outset, the Dura-Ace 7401 pedal design was recognized as innovative, because Shimano stripped all the excess metal away in the body's shape leaving a light aerodynamic shape that has now been copied. The pedal's spindle length was reduced considerably as they narrowed the body width. The shorter spindle reduced the amount of steel necessary to support the pedal. The body of the 7401 is made of cast aluminum, with a cavity for the LOOK mechanism to penetrate from the back, and has a removable plate to clean and lubricate the mechanism. The body's shape permits the bike to lean up to 34 degrees from vertical without pedal to ground contact, or it is said to have a "34 degree lean angle". The interior of the body is tapped with threads for the spindle to seat. The spindle is made of machined nickel Cro-moly steel that is chrome plated, then has the bearing surfaces ground to a fine smooth finish. The 6402 pedal set was introduced for the 1992 cycling season, and is Shimano's most recent incarnation of the LOOK compatible series of pedals. 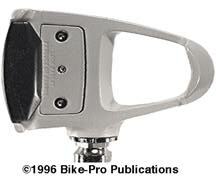 They use styling similar to the 7401 pedals, with one added feature and a less dynamic bearing assembly. The body of the 6402 is made of cast aluminum with a cavity for the LOOK retention system. The 6402 pedal is cast to permit the bike to lean 34¡ before there is pedal to ground contact. The interior of the body is tapped with threads for the spindle/bearing cartridge to thread in. This is Shimano's most affordable set of LOOK compatible clipless pedals. They share some things in common with the other sets but have something special of their own. The body is made of cast aluminum alloy with a cavity for the LOOK mechanism to be installed at the rear. The pedals' bodys are cast with a 34 degree outside lean, so the bike can be tipped at 34¡ from vertical without pedal to ground contact. The interior of the body is threaded for the spindle and bearing cartridge assembly.